Sperry's: I had a great business dinner here, and it's definitely a hidden gem within a strip mall in Franklin. The minute you walk in, you're transported into dark, wood-paneled hideaway. I had a crab cake appetizer, delicious steak, and tasty dessert. I'm not sure I'll ever go back, because it is a fancy-pants joint, but it's an good old school steakhouse for sure. 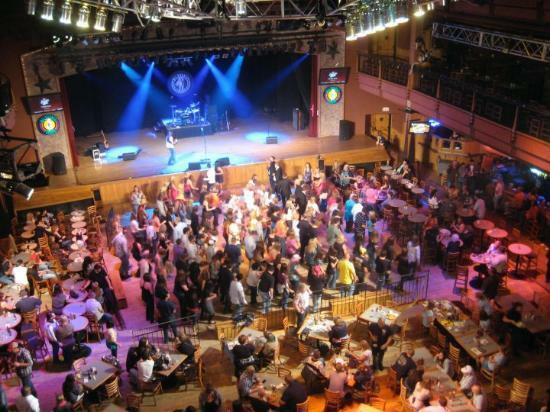 Wild Horse Saloon: I went to another work function at Nashville's Wild Horse Saloon downtown, and even though our meal was catered, I loved it! Fried pickles and nachos to BBQ to a tasty gouda ravioli... yum. I also liked the live music and country line dance instruction. This place is a a TOTAL TOURIST TRAP, so be prepared for it to be cheesy. I preferred it for the private party that we had upstairs, probably wouldn't go for dinner myself otherwise. Boscos: I liked Boscos. It's a great restaurant if you want a large beer selection, and I liked their appetizers and menu. It's a nice atmosphere for a post-work happy hour or dinner, and they have a few locations. I had the lasagna and it was pretty good! Wholy Crepe: I love crepes! And this cute little restaurant in Franklin delivers a ton of options that are pretty good. I went for a breakfast type crepe, as well as a little dessert one to take away. I'll definitely be heading back. Molinari's: I LOVE GARLIC. This is probably the best Italian food I've found in the Franklin area, located in a strip mall in Cool Springs. A coworker recommended this place, because she knows I love garlic. The bread at Molinari's comes with TONS of minced garlic on it. I'm talking a clove per roll, at least. It's fantastic.